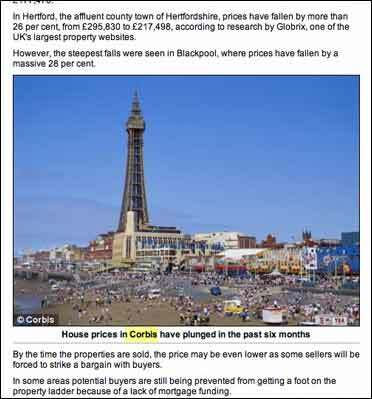 Sleepy caption subs at the Daily Mail have inadvertently alerted the world to a breaking story concerning falling house prices in the town of Corbis on the north-west of England. Sleepy caption subs at the Daily Mail have inadvertently alerted the world to a breaking story concerning falling house prices in the well-known tourist town of Corbis in the north-west of England. Using a photograph apparently sourced from stock giant Blackpool, the newspaper has alerted its readers to a precipitous property price fall of 28% in the Bill Gates owned town. Sadly for those of who monitor the dealings of the former Microsoft boss, the newspaper pulled the exclusive a few hours later.